But that will all be better once we arrive at a stable first release of the Big Red Stop. We hope ;) Our main focus has been on getting the design, user and visitor flows, the technical design and the basic online presence together. We're also gathering ideas and structure for our communications and that will be complete when we launch. It's easy to get distracted by all sorts of things right now so what we're trying to do is launch one extremely tight build which we feel solves the basic problem and creates real value for users. If we can do that one thing, then the rest of our list follows and we can start examining engagement, signups and our push. 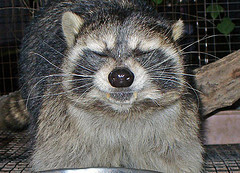 Right now all we have in terms of a push out is an image of a happy raccoon (below) we found on Google. We see that as a small, but crucial, win. On the plus side we've done micro-tests with friends and family on the interface and interactions for the app and their feedback was both positive and valuable. In the next two weeks we'll have a gathering of friends and see how that feedback goes. We're still on course for a release in March so ping us on @bigredstop on Twitter if you want a pre-release version to play with!